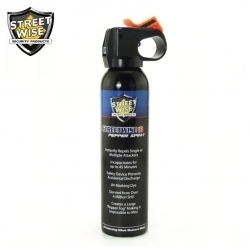 This 9 oz Streetwise 18 pepper spray is perfect for carrying with you when camping, hiking or just simply going to town. It will create a fog of pepper spray which makes it impossible to miss your attacker. Large enough to take care of any situation.